Clown hysteria has been happening for decades. Maybe people just really hate clowns. Late Monday evening, thousands of students gathered on the Penn State campus to hunt a masked jokester after reports of a clown sighting circulated on social media. But the midnight mob was about as successful in capturing that clown as police were in finding the one that had supposedly been murdered in Fort Wayne, Indiana. And if you’re wondering why both the Penn State students and the Fort Wayne police couldn’t catch their clowns, it’s because neither one ever actually existed. Other than a handful of ill-minded pranksters, there are no actual clowns behind the recent clown hysteria. All the supposed sightings are just dark figments of the public’s feverish imagination. And while this phenomenon of unsubstantiated clown hysteria may seem unprecedented, it’s actually been happening for decades. The clown’s popular association with the macabre started in full force when John Wayne Gacy, a notorious serial killer in the 1970s, painted a series of portraits of himself dressed as his alter ego — Pogo The Clown — while sitting on death row. Soon, the use of clowns in horror films like “Poltergeist” (1982) and novels like Stephen King’s “IT” (1986) picked up on these underlying fears. Mix in spooky renditions of the Joker in various Batman movies, and you have the pop culture foundation for widespread fear of clowns. 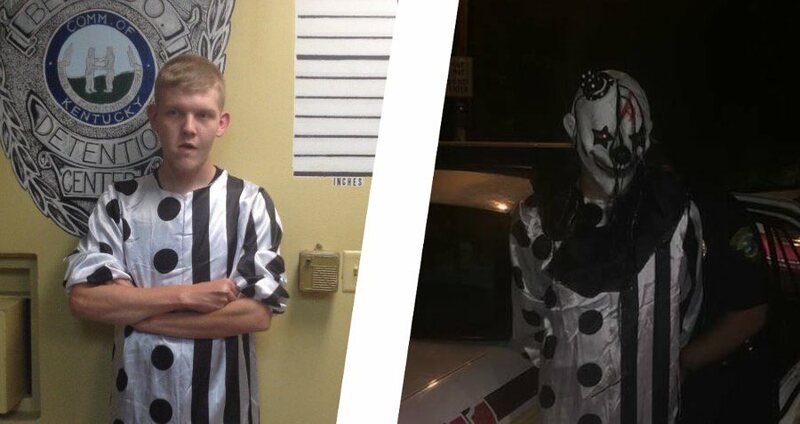 This fear is the reason why people like Jonathan Martin, a 20-year-old in Kentucky, end up being arrested over a bad joke — people don’t mess around with clowns. Middlesboro Police DepartmentJonathan Martin was found in “full clown costume” hiding amongst trees around an apartment complex at 1 a.m., according to police. 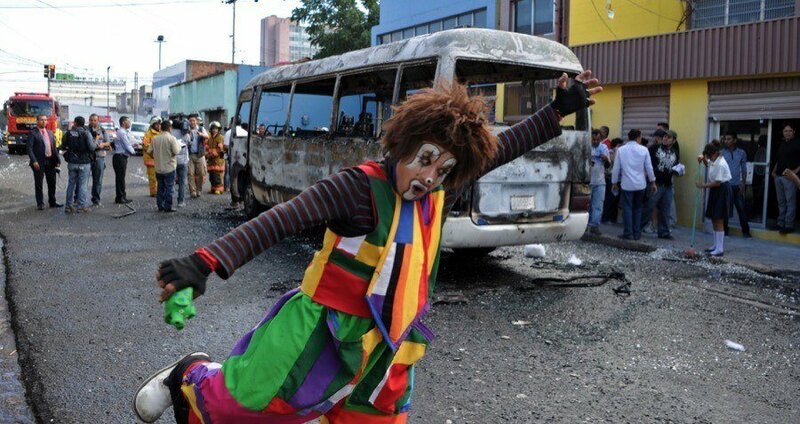 And for every real report of a clown-related incident, there’s a string of false reports, such as the 24-year-old man recently charged in Winston-Salem, North Carolina for dialing 911 over a non-existent clown knocking on his window, or the four students — ages seven to nine — who claimed a clown tried luring them into the woods in Annapolis, Maryland. And that exact sort of thing has been happening for far longer than most of us realize. For example, as recently as 2014, California had a rash of clown sightings — “Mystery clowns that are terrorizing California towns at night have started carrying GUNS,” wrote The Daily Mail. But this phenomenon isn’t even limited to the United States. Australia had a scare in May 2015, as did England in 2013. However, at the same time that Homey was supposedly terrorizing students in Chicago, he was also allegedly wreaking havoc in New Jersey — which of course calls the whole story into question. At the same time, Homey supposedly terrorized schoolchildren in Michigan as well. One child even reported that a clown grabbed their ankle while on the playground during lunchtime, but that they managed to escape and run into the elementary school. The clown was never found. Aside from the Homey scare of 1991, America’s long history of clown-related hysteria includes incidents in Texas in 1992, New Jersey in 1997, and Kentucky in 1988. But if you’re wondering why you’re so creeped out by clowns, it’s likely because you just don’t enjoy being smiled at when you don’t want to be. Smiles typically come across as lighthearted and warm, but when you encounter a forced smile looking down into you, that good feeling transforms into something…not quite right. Still, if you are driving down a dirt road in the middle of night and come across somebody in a clown mask, consider rolling up the window. And if they start walking toward you, maybe lock the doors, too. Next, check out the Clown Hotel and five more of the six spookiest hotels in the world, before taking a look at how scary Ronald McDonald used to be.